Nothing beats a pepperoni pizza as the ultimate comfort food this summer. While it's easy to order from a pizzeria near you, we are challenging you to try to make one at home. Not only are you sure that the ingredients are fresh, pizza making is also a fun, bonding experience. 1. Preheat oven to 230 degree celsius. 2. 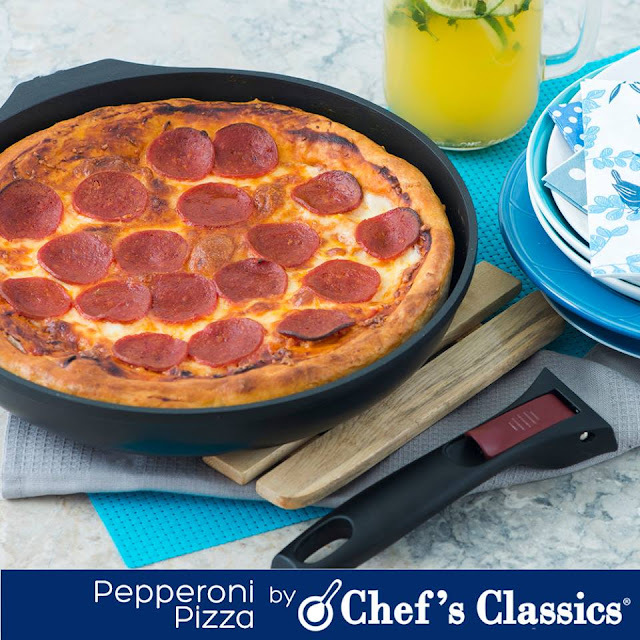 Put pizza crust in the Chefs' Classics Caper Detachable Frypan and place in oven. 3. Brown until you create crust. Then, remove from oven. 4. Top pizza dough with pizza sauce and pepperoni. Sprinkle cheese as desired. 5. Bake the pizza until the topping is cooked and cheeses are melted. 6. Cut the pizza into 6 equal parts, and serve hot!